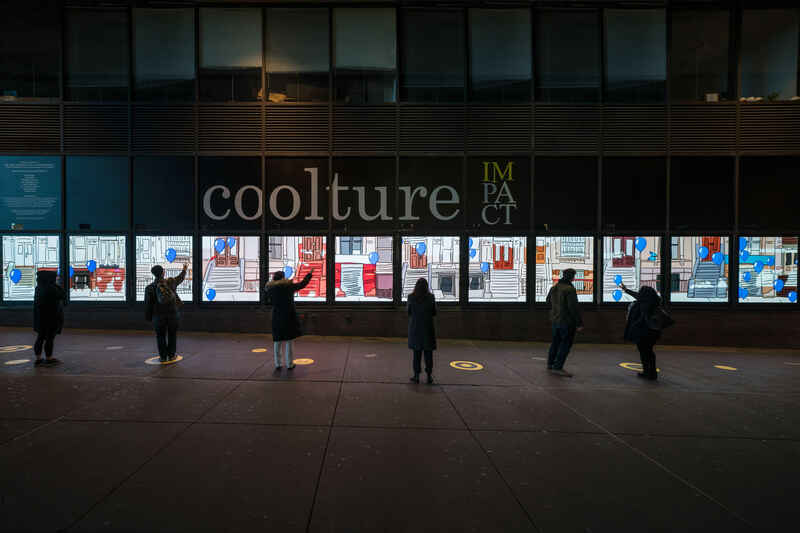 cooltureIMPACT is a first-of-its-kind public platform for the emerging art form of responsive art. Located along the northern exterior of the Port Authority Bus Terminal at West 42nd Street and 8thAvenue in Manhattan’s Times Square neighborhood, it boasts the largest interactive screen in New York—a 72-foot, 5.5 million pixel, high-resolution LED display. 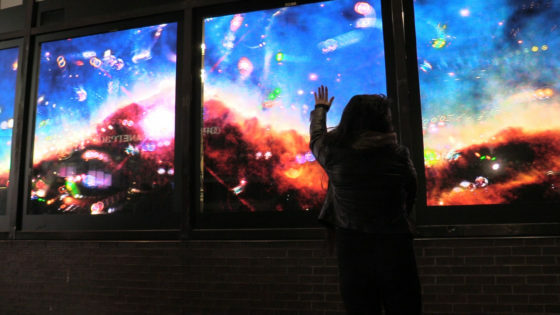 A site-specific implementation of the NOIRFLUX Interaction Framework provides full multi-participant interaction out to 18 feet away from the screen, along the entire length. NOIRFLUX designed and developed this responsive art system for the Cultural Semiotic Alliance, a non-profit arts organization that will be presenting a series of responsive art works on the platform. 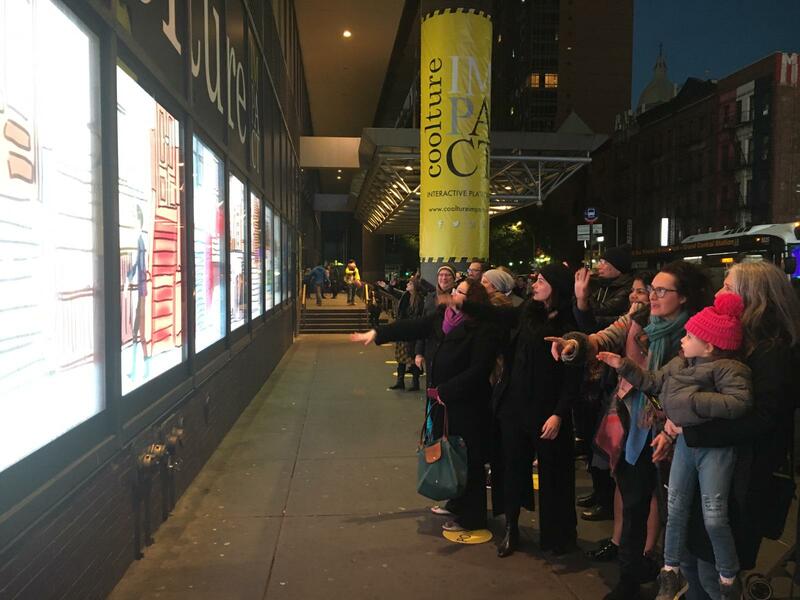 The second responsive art installation to be featured on cooltureIMPACT, Stardust Wishes offers visitors a unique experience of this emerging form of art. By moving, dancing, waving, or pointing, visitors create their own spectacular lightshow. Whether shooting fireworks across the massive screen, effortlessly creating swirls of stardust with a wave of their hand, or sending kaleidoscopic nebulae through the galaxy—they are essential participants in a unique artistic experience created by themselves and the visitors around them. 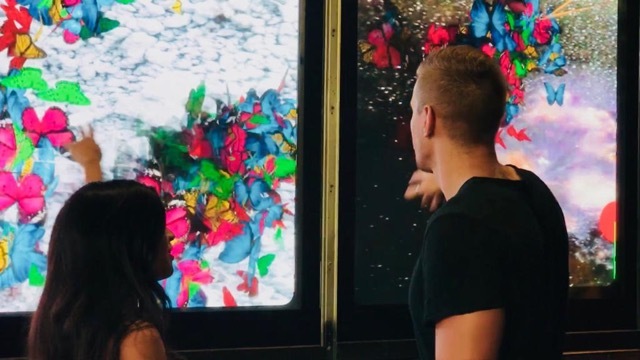 Created by NOIRFLUX, Stardust Wishes immerses visitors in a fantastic playground of participation where they can experience the joy of interacting with an environment that responds to and surprises them. THE NOW, the inaugural work of responsive art to run on the cooltureIMPACT platform, offers a journey into magical worlds, opening doors to hidden places and participatory environments. THE NOW explores transitory spaces and unseen parallel realities, in a cinematic voyage to visually striking realms, live painting, and animated characters with evolving narratives. 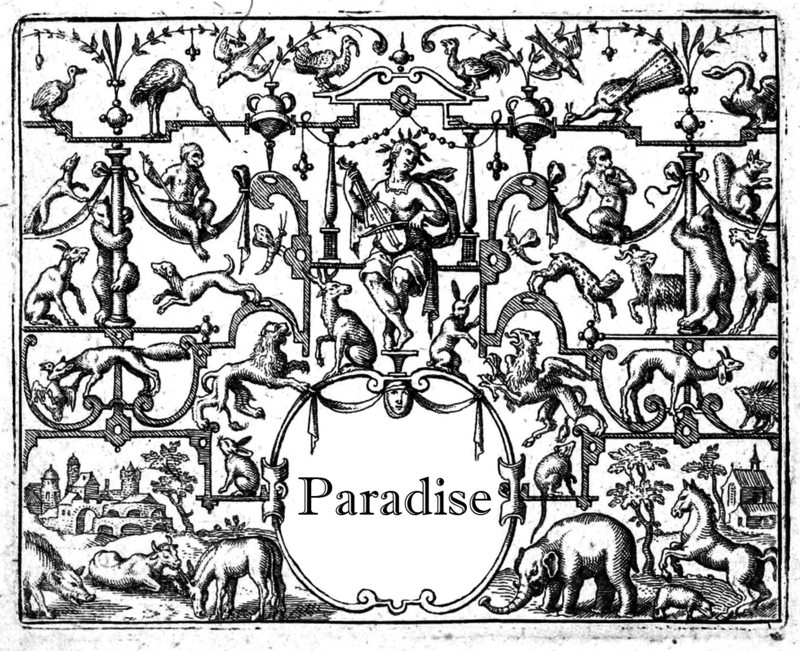 Visitors are invited to walk, move and unravel the different storylines. THE NOW was created by Laia Cabrera and Isabelle Duverger (Laia Cabrera & Co ) in collaboration with NOIRFLUX and Karan Parikh. 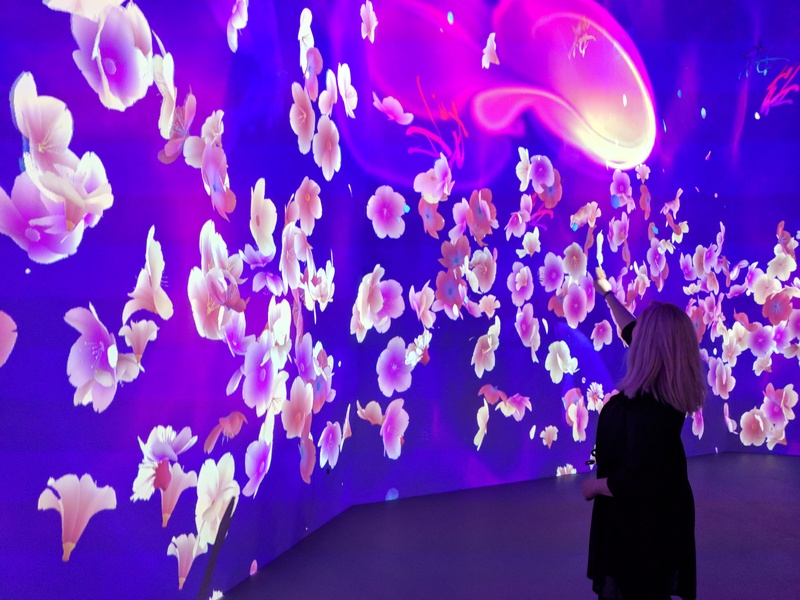 SAKURA YUME (Cherry Blossom Dream), created by NOIRFLUX in collaboration with Artechouse is an immersive and fully responsive art installation celebrating Japanese springtime themes including cherry blossoms and koi. Leveraging Artechouse’s extraordinary 270-degree, 1850-square-foot Main Gallery, NOIRFLUX’ multi-person responsive design provides full interaction throughout the entire space. Visitors can interact with imagery on any of 24-foot tall walls, whether inches away or up to 49 feet across the gallery. NOIRFLUX has also created a companion installation, Lantern Alley, in the museum’s Gallery Two, where visitors can stroll through a narrow Tokyo street as the lighting responds to their footsteps. To accompany the Smithsonian’s Long Conversation event for the 2017 Smithsonian Ingenuity Festival, NOIRFLUX collaborated with oil painter Nora Maccoby to create the immersive interactive environment Surfing Stardust: Destination Earth at the Smithsonian Arts & Industries Building. 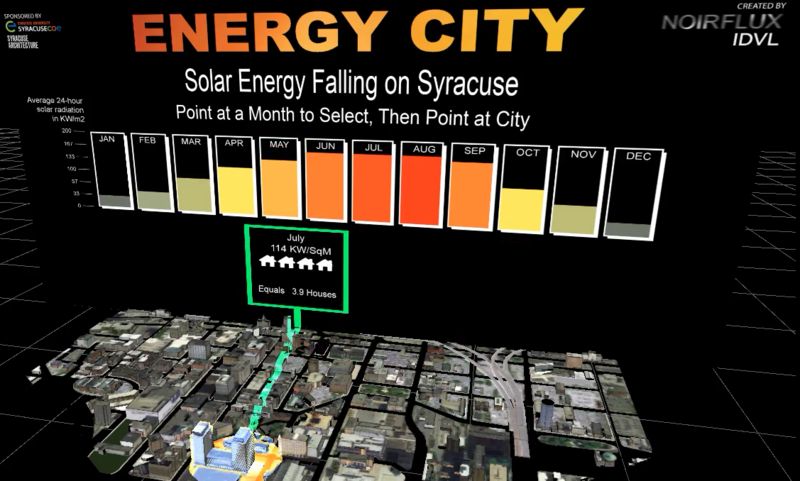 NOIRFLUX collaborated with Syracuse University Architecture Professors Amber Bartosh and Bess Krietemeyer, and the MoST’s Kevin Lucas, to create Energy City, an interactive 3D model that allows visitors to experience downtown Syracuse through the lens of solar radiation—an otherwise invisible type of data. Visitors can walk around the model, select a dataset to view as an overlay, then point to an area of the city to see how much solar energy could be harnessed in different locations. Energy City continues to evolve as new datasets, such as wind energy, building energy use, and sustainable transportation data, are being developed by Syracuse Architecture students in a course taught by Krietemeyer. Students and faculty can now interact with large scale visual information and sound through NOIRFLUX’ JournoWall. The design of this participatory environment supports members of the greater Syracuse University community in the ongoing creation of novel information applications and content. The JournoWall is a 28′ wide fully interactive video wall consisting of twenty-one 55″ monitors running in full HD, providing over 43 MegaPixels of resolution. Full multi-user gesture interaction is supported from the screen surface out to 8′ away from the screens, across the full 28′ width. The Unseen Sun: Waving your hand near the large moving sun reveals intricate moving solar structures at selected depths of the sun. By pointing at a graphic menu, you choose the temperature filters corresponding to the solar depth you swish to explore. The base ‘surface’ image is of the sun at 80,000 degrees, and as you move your hand across the surface, the corresponding image of the selected depth is revealed, both images moving in sync. The imagery is from NASA’s Solar Dynamics Observatory, which updates with a new still image every 15 minutes in a variety of wavelengths. The installation displays a moving animation of the data from the previous five days, up to the last 15 minute image. Dancing with Navier-Stokes: Visitors’ gestures generate and set in motion vibrant colors that move and mix with the grace and rhythm of fluids and gases in the natural world. 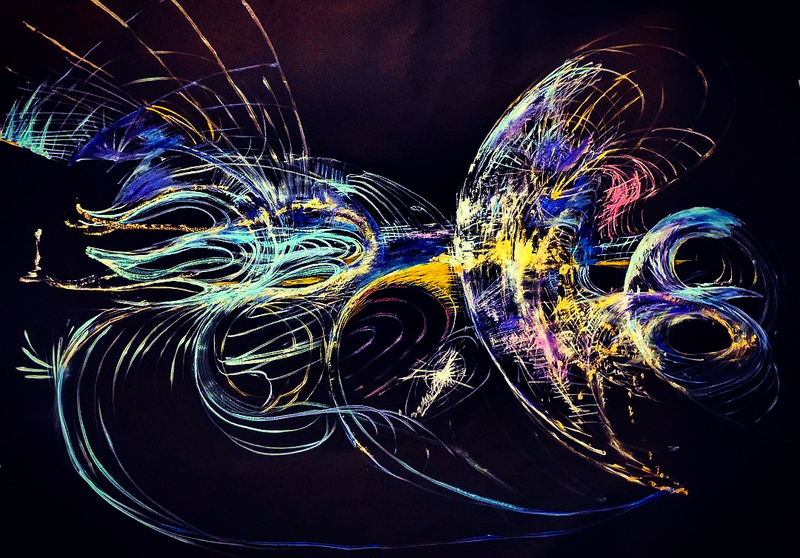 NOIRFLUX creates this lifelike responsiveness by incorporating the Navier-Stokes fluid dynamics equations within our graphics processing code. As they transverse high-resolution images of Mt. Everest and other iconic mountains and cliffs, the wall keeps a running score of targets activated by each climber. Interactive photographs. One cannot be a tourist without changing what one sees. These photographs were taken during one of the first of Pan Am’s “Flying Boat” visits to Hawaii in late 1936. Installation visualization of the immersive responsive artwork, Lambent Gambol 2. The graphics were recorded live, of actual interactions, with no post-processing. The overview shots show the live point-cloud data from a depth camera that is being used as input into the displayed interactive visuals.